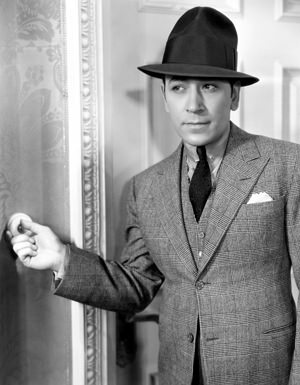 "George Raft in Lux Radio Man Power"
George Raft set the standard for the movie gangster of the 1930s. (In his case, he could pull the gangster parts from real life.) Like many of the movie stars of the time, he also performed on radio. Outside of acting, Raft led a truly colorful life. Though he enjoyed tremendous success in the 1930s into the early-1940s, a series of poor decisions saw his star fade in Hollywood. While he still appeared on radio in shows like the Lux Radio Theater, even starring in The Cases of Mr. Ace from 1945 to 1947, he acted mostly to B movies and guest starring roles on television. However, Raft was one of the first Hollywood stars to star in a television show in 1953. 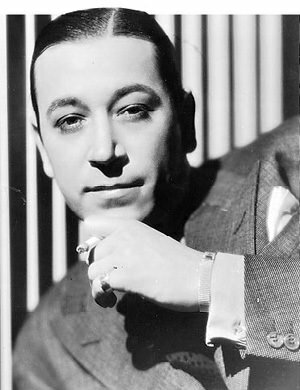 The George Raft Collection include appearances on the Martin and Lewis Show, The Bob Hope Show, Texaco Star Theater, and Lux Radio Theater, including all of the existing episodes of Raft's The Cases of Mr. Acee. Eva and Conrad Ranft were the proud parents of baby George Ranft (later changed to Raft), born in either 1895 or 1901; take your pick. (There is some confusion about the birth year.) He was born into poverty in Hell's Kitchen, New York City. As a child, he was friends with future gangster Owney Madden, who also ran the famous Harlem nightclub, the Cotton Club. Raft also admitted to being a driver and a gunman for Madden. In a Saturday Evening Post article written by Raft, he admitted to being friends with several other gangsters later in life like Bugsy Seigel, Al Capone, Dutch Schultz, and several others. Raft learned early in life that he had a talent for dancing, using that talent to begin dancing in nightclubs. Eventually, he started dancing in a speakeasy stage act. His success in the speakeasy helped earn him parts in the chorus on Broadway. Raft worked regularly on Broadway and also in London in the early 1920s. 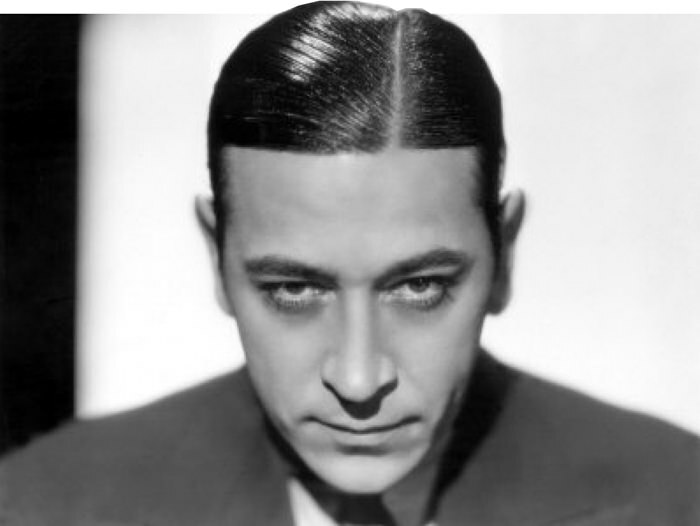 During his time as a dancer in the early 1920s, Raft met several future stars including Rudolph Valentino and Fred Astaire. Astaire became a lifelong friend and often visited him on set. In his biography, Astaire stated that Raft did the fastest Charleston he had ever seen. With Madden's encouragement, Raft headed out to Hollywood. He immediately started getting small parts in movies. His first significant role, where he was first noticed was in the 1932 movie, Scarface. Raft was coin flipping gangster, Guino Rinaldo. He played the part so well that people thought Raft wasn't playing a part but was a real gangster, which wasn't far from the truth. After that part, Raft became a leading man, often playing a gangster, or a tough guy through the early-1940s. Raft could have any part he wanted and was offered the lead in High Sierra and The Maltese Falcon but passed. Both parts went to Humphrey Bogart, launching Bogart's career as a leading man. He was also offered the lead in Double Indemnity and turned it down too (the part went to Fred MacMurray). Raft's career went down from that point. His last most recognizable role was as a parody of his gangster roles in Some Like It Hot. In 1945, as his star was descending in Hollywood, Raft was offered the part of in The Cases of Mr. Ace as Eddie Ace, the owner of the Ace Detective Agency. He accepted the show which ran for two years though only four shows are available. In the show, Mr. Ace's cases come to life as he tells Dr. Gale, a female psychiatrist who is writing a book about the criminal mind, about his last case. The show always begins with Mr. Ace knocking on Dr. Gale's door. In the summer of 1951, Raft took over the part of Rocky Jordan. He played the part until the show ended in June 1953 . The basics of the show stayed the same. Rocky, who was based on the Rick Blaine character in Casablanca, had the same types of adventures with ever present police officer Sam Sabaaya. However, Raft played the part as bar owner with a heart of gold and Chris the bartender narrates to the audience. Notices in several newspapers and industry journals stated that the network intended to take the series to television which was why Raft was hired. The show never went to air with Raft in the lead role. 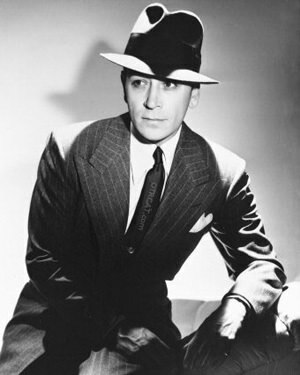 Like many stars of the era, George Raft also performed in radio plays. He performed in Lux Radio Theater plays like Cheating Cheaters, Manpower which was a dramatization of the movie he made with Marlene Dietrich and Edward G. Robinson, and several others. Raft also appeared on variety shows like Bob Hope, and interview shows like Louella Parsons. Some of the most intriguing stories about Raft center around his admitted ties to real-life gangsters. He was a gunman and driver for Owney Madden of Cotton Club fame. When he worked the nightclub and speakeasy circuit as a young man in the 1920s, he came into more contact with well-known and lesser-known mobsters. He associated with these men throughout his life and never tried to hide it. He also didn't hesitate to use those contacts. Hollywood legend says that Raft saved Gary Cooper's life. Gary Cooper was dating a gangster's moll at one point. The gangster, who was never mentioned in the research, allegedly put Cooper on a hit list. Raft heard about the hit and went to Cooper to talk him into breaking off the romance then called the gangster to talk him out of killing Cooper. Another Hollywood great, James Cagney, credits Raft with saving his life. Cagney was president of the Screen Actor's Guild from 1942 - 1944. During that period, the mob was trying to make inroads into Hollywood. Cagney waged a war to keep the mob out. After trying to frighten Cagney and his family into backing off, the mob sent a hitman to drop a heavy Klieg light on him. Again, Raft made a phone call and the hit was called off. Though he used his connections to help friends, those connections came back to bite him on several occasions. He was denied a gambling permit for a development in Las Vegas because of his connections. Raft was also denied entry to the UK because of those same mob connections. Raft married Grayce Mulrooney, who was several years older. The marriage did not work out, and the couple separated a short time later. 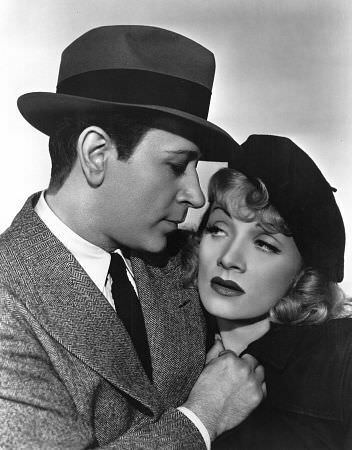 Because she was a devout Catholic, Mulrooney refused to divorce Raft though he was involved with several actresses over the years such as Marlene Dietrich, Betty Grable, and Mae West. He begged his wife for a divorce to marry Norma Shearer, but she refused. By his own admission, Raft made and lost several fortunes. Even though he was no longer in demand as a leading man, he still worked hard in B movies, guest starring on television, and even hosting at a casino he co-owned in Havana. Enjoy these old time radio shows by one of radio's most colorful characters.